I've been enjoying doing small watercolor studies of a group of abstract work that might look wonderful done very large in multi-media fashion. A little p-shop, BANG, a large canvas hanging in a modest den. Boy, what I would do with a roomy studio that could handle six-foot, eight-foot canvases! I still have faith in my attempts at exploring less literal, more poetic themes that fit in a living space. Ypu're absolutely right. It's a bit sobering to work on a piece from a consistent perspective only to realize it looks better when it's flipped. An unintentional improvement makes me remember how intuitive abstract truly is. Years ago, the Museum of Modern Art in NYC hung one of Matisse's paintings upside down in the exhibit hall. Nobody noticed it for months. Maybe your next painting could be a big red arrow with the words "This Side Up". Interesting painting. I'm very curious about your choice of room to show this-what the heck is going on in this room-a giant black vent, an odd chair that seems to be meant for torture or an adult game...maybe I've seen too much David Lynch. I picked a bland room to showcase the "painting". 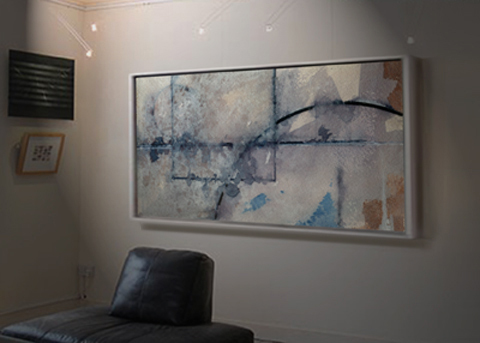 Putting it in a well-appointed living space would put too much emphasis on the surroundings, as if the nearby furnishings and art on the walls made my piece legitimate. I'm thinking that if the painting ADDS interest to a room, it's doing the job. This is for site admin: Please check SLM under my name..this back link generator had been launched 2 days ago and already gave me a 2 pages jump in google. Make your self a favor and go grab it until its not saturated. This page contains a single entry from the blog posted on February 7, 2012 7:21 PM. The previous post in this blog was DVD Cover Illustration Idea.